sister projects: Wikipedia article, Commons gallery, Commons category, quotes, taxonomy, travel guide, Wikidata item. 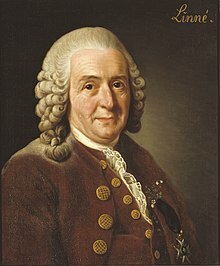 Swedish botanist, physician and zoologist who laid the foundations for the modern scheme of Binomial nomenclature; known as the father of modern taxonomy, and is also considered one of the fathers of modern ecology. In older publications sometimes the abbreviation "Linn." is used. This author page is for the elder Linnaeus. For his son, see Carolus Linnaeus the Younger. This page was last edited on 12 May 2018, at 07:09.